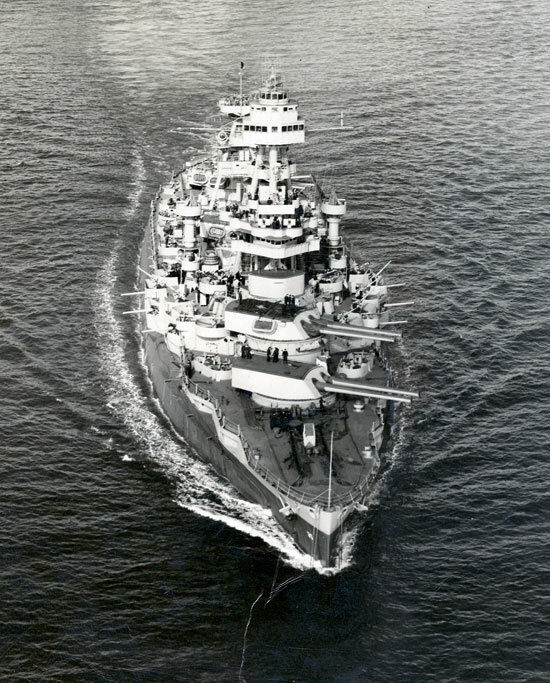 Texas is the last of the battleships patterned after HMS Dreadnought to participate in World Wars I and II. Considered the most powerful warship afloat because of her ten 14"/45 guns in five twin turrets, Texas was commissioned in March 1914 and proceeded almost immediately to Mexican waters where she joined the Special Service Squadron following the "Vera Cruz Incident". She returned to Atlantic Fleet operations in the fall of 1914. In 1916 Texas became the first U.S. battleship to mount anti-aircraft guns and the first to control gunfire with directors and range-keepers, analog forerunners of today's computers. After the U.S. entered World War I, she spent 1917 training gun crews for merchant ships that were often attacked by gunfire from surfaced submarines. Texas joined the 6th Battle Squadron of the British Grand Fleet early in 1918. Operating out of Scapa Flow and the Firth of Forth, Texas protected forces laying a North Sea mine barrage, responded to German High Seas Fleet sorties, fired at submarine periscopes observed by multiple ships, and helped prevent enemy naval forces from interrupting the supply of Allied forces in Europe. Late in 1918 she guarded the German Fleet enroute to its surrender anchorage and escorted President Wilson to peace talks in France. In 1919 Texas became the first U.S. battleship to launch an aircraft and served as a plane guard and navigational reference for the first trans-Atlantic flight by the seaplane NC-4, after which she transferred to the Pacific Fleet. In 1924 Texas returned to the Atlantic and sank the incomplete battleship Washington (BB-47) so the U.S. would be in compliance with the Naval Arms Limitation Treaty of 1922. From 1925 to 1927 Texas underwent modernization in Norfolk, VA, transitioning from coal to oil fired boilers and receiving numerous other alterations. In 1927 Texas became the flagship of the U.S. Fleet and inaugurated the use of "talking" pictures for crew entertainment. She embarked President Coolidge for a trip to Cuba in 1928. Texas received the first commercial radar in the U.S. Navy in 1939. In 1940, Texas was designated flagship of U.S. Atlantic Fleet. The First Marine Division was founded aboard Texas early in 1941. That same year while on "Neutrality Patrol" in the Atlantic, Texas was stalked unsuccessfully by the German submarine U-203. Texas escorted Atlantic convoys against potential attacks by German warships after America entered World War II in December 1941. In 1942, Texas transmitted General Eisenhower's first "Voice of Freedom" broadcast, asking the French not to oppose allied landings on North Africa. The appeal went unheeded and Texas provided gunfire support for the amphibious assault on Morocco, putting Walter Cronkite ashore to begin his career as a war correspondent. After further convoy duty, Texas fired on Nazi defenses at Normandy on "D-Day", June 6, 1944. Shortly afterwards she was hit twice in a duel with German coastal defense artillery near Cherbourg, suffering 1 fatality and 13 wounded. Quickly repaired, she shelled Nazi positions in Southern France before transferring to the Pacific where she lent gunfire support and anti-aircraft fire to the landings on Iwo Jima and Okinawa. 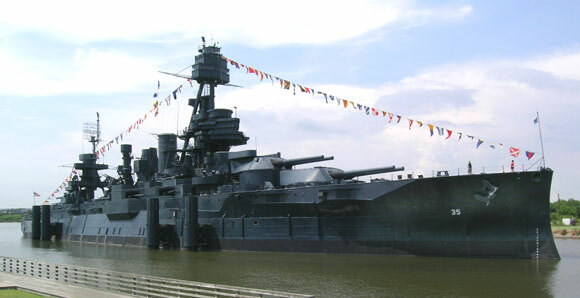 In 1948, Texas became the first battleship memorial museum in the U.S. Texas was placed under the stewardship of Texas Parks & Wildlife Department in 1983. The ship underwent drydock overhaul in 1988-90 and began systematic restoration to her 1945 configuration in Measure 21 blue camouflage. USS Texas is a National Historic Landmark. Texas's reciprocating marine steam engines are Historic Engineering Landmarks.